Valhein Item Builds Guide for Arena of Valor (AoV). Each build is geared toward a different play style, so choose one that fits your personal preference. These items are necessary in order to play solo lane Valhein optimally. Only diverge from a core item if you are a very experienced player or you have a very good reason for doing so. Blitz Blade The massive buff to Blitz Blade in August 2018, along with the rise in popularity of Arum and Roxie, has led to the emergence of Valhein as one of the strongest solo laners (non-mid) in the game. The new Blitz Blade seems tailor-made for Valhein, with insane attack speed to go with an amazing passive and movement speed to boot. In fact, Blitz Blade can be seen as a core item for any Valhein build, from solo lane to AD to AP. Frost Cape Because being in the solo lane means he is by himself by definition, Valhein needs a bit of defense to help him avoid ganks and sustain himself while dueling. Frost Cape is the best utility item for such a role, giving Valhein extra CDR and an amazing slow passive that will help Valhein single-handedly CC his target into the ground. These items are necessary in order to play AD Valhein optimally. Only diverge from a core item if you are a very experienced player or you have a very good reason for doing so. Claves Sancti Claves Sancti is a great pick on almost every marksman due to the immense amount of bonuses it provides. Attack damage and critical chance are already a strong combination, doing a lot to build up the wielder’s DPS. In addition to that, however, is a pair of strong passives, one of which buffing the damage that each critical strike deals while the other speeds Valhein up each time he lands a critical strike. This second effect is particularly powerful on Valhein, it meshing well with his passive ability. Slikk’s Sting Offering attack speed, critical chance, and movement speed, Slikk’s Sting is a great fit for Valhein. Its passive is a nice plus as well, giving Valhein the always valuable Resistance stat whenever he scores a critical strike. With how frequently he will be attacking and the raised critical rate from this and Claves Sancti, Valhein reliably keep the resistance bonus up throughout full fights. These items are necessary in order to play AP Valhein optimally. Only diverge from a core item if you are a very experienced player or you have a very good reason for doing so. Apocalypse Given that his abilities all act as normal attack modifiers, Apocalypse can stack Valhein’s damage up into a terrifying burst. Starting an ability will proc Apocalypse’s passive and cause the damage to land with the ability’s modified strike. The cooldown speed the item additionally offers is nice as well, ensuring that the gunman will be able to through out empowered attacks more frequently. Zweihander While not a popular choice on most mages, Zweihander can be quite useful to Valhein. Given his rather high attack speed, he will find a lot of use from the additional on-hit damage that the item offers. In addition, Zweihander’s second passive will boost up his speed even further, giving him more reliable use of his passive as well. Add this to the movement speed boost that the item offers as well, and it’s almost as if it was made to perfectly compliment Valhein’s kit. Omni Arms Omni Arms is particularly useful to Valhein given how his abilities work. As they modify his regular attacks, the extra damage will apply to the same attack that is modified by the ability. This can allow for some exceptional burst damage. On top of this, the item offers a wide range of useful stats, all of which greatly beneficial to the marksman. Orb of the Magi While not necessarily a must on Valhein, it can still be very beneficial to him when he chooses to build magic damage. The sustain it provides through its regeneration is a great way to stay up and farming in lane, and it is no slouch when it comes to ability power offerings either. Muramasa Later in the game, Valhein might find himself having trouble with bulkier foes, unable to push through their armor. When this happens, Muramasa is a must. It slashes through a percentage of enemy armor, ensuring that none get so strong that they can completely ignore Valhein’s attacks. Hecate’s Diadem When building ability power, there is no better source than Hecate’s Diadem. It doesn’t offer much in utility, but the amount of raw power it can offer due to its amplification passive surpasses all other items. A must on almost all damaging castiers. Fenrir’s Tooth Just as Hecate’s Diadem offers tremendous magical power, Fenrir’s Tooth offers immense physical power. In addition to providing more attack damage than any other single item, the weapon helps finish off enemies by amplifying the damage done to low health targets. Boomstick Boomstick offers a lot to a mage’s damage potential. Not only does it offer a lot of ability power on its own, its explosion effect effectively adds an additional 1.0 AP to an ability’s scaling when it activates. Given the bursty nature of mage Valhein’s kit, this is a great tool when picking off enemies. Fafnir’s Talon With how quickly Valhein can attack, Fafnir’s Talon will be a great way to tear down his targets’ health. Upping his attack speed, attack damage, and life steal, the item is a valuable source of stats to the marksman. Beyond that, though, its passive causes each of Valhein’s attacks to shred away a percentage of the target’s current HP. This is especially useful when dealing with foes who have stacked up HP items as a result. Soaring Aura When playing as a mage, Valhein as a comparatively short range to other spellcasters. As such, he can benefit quite a lot from the magic pierce aura that Soaring Aura provides. Not only will it make his abilities deal more damage, his allies’ magic abilities will hit harder as well. Devil’s Handshake Valhein gets a lot out of attack speed and thereby can make great use of the attack speed focused Devil’s Handshake. His ability to quickly chain out attacks will allow him to build stacks exceptionally quickly. In addition, the added movement speed it provides will help with his favored guerilla tactics, making it easier for the gunman to slip in and out of battle. Holy of Holies Holy of Holies is a great way to finish off a magic build, offering large amounts of ability power and HP. While it does not offer any sort of special passive, the stat value alone makes it a great pick up. War Boots Relying heavily on attack speed, War Boots is a natural choice for Valhein. These are a safe bet both when building up attack damage and can occasionally find their place in creative ability power builds as well. 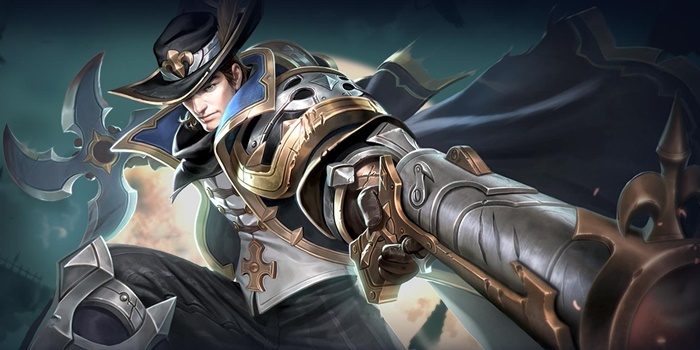 Gilded Greaves A more defensive choice, Gilded Greaves keeps Valhein mobile when the enemy try to lock him down with control effects. The boots additionally offer magic resistance, making them a nice choice when facing magic heavy teams. Enchanted Kicks When looking to up his burst potential, Enchanted Kicks will allow Valhein to pierce through their magic defense. Though only useful to Valhein when building ability power, they remain a strong way to enhance his damaging potential. A new build that focuses on Valhein’s ability to kite opponents with his stuns and Hunter’s Mark. His main source of damage will be Blitz Blade, it offering a lot to his attack speed centric kit. Frost Cape and Hyoga’s Edge will add to his sticking power, making it nearly impossible for opponents to escape the demon hunter once he engages. The last two items in this build are extremely variable – we’ve seen everything from Claves Sancti to Zweihander to more defensive items. This turns the marksman into a mage assassin, trading his sustained damage for a strong poke potential. By quickly chaining his skills, especially if preparing one early to better synergize with Apocalypse, Valhein can rapidly rip away large portions of health from the enemy. Boomstick, Hecate’s Diadem, and Holy of Holies all provide large amounts of ability power to increase the damage each of his enhanced glaives do. Zweiahander and Apocalypse are less common choices for mages, they relying on a strong normal attack core in order to get proper usage. Given that Valhein is originally a marksman, though, he can find some use with the magically strengthened normal attacks and added burst to his abilities. This build is focused around attack speed, something that Valhein can get quite a lot from. His passive occurs once every three attacks and so being able to attack more swiftly will naturally cause it to occur more frequently and more reliably. Fafnir’s Talon, Slikk’s Sting, and Omni Arms all contribute to a very high attack speed, Valhein hitting the maximum of 200% at level 15 after landing his ultimate. A more aggressive build than the more popular variant. Valhein will still be a kiting machine with the assistance of Hoga’s Edge, but will have considerably more damage at his disposal with the assistance of Zweihander, Apocalypse, and Slikk’s Sting. Well, once again I have a build with no real order so I’m interested to see how you guys will order this build. My current Val build consists of Beast, War, Claves, Slikk, Blitz, and Mura. This isn’t my set in stone order so feel free to switch around anything you like and if you have any improvements feel free to add it. Good luck figuring this build out because I’m lost but it works haha. So,critical damage of magic make a lot of damage? If the enemy has too much magic defense, berith’s could probably be switched for staff of nuul. This would make you more vulnerable, so sticking to your jungler might be beneficial so they can burst away any enemies wanting to kill you. Anyone have tried hybrid build before? I should also add that for Dark’s build, Spoopy Mask can also be replaced with Staff of Nuul (pre-Battlefield Reborn) depending on the situation.